“Board” with your boardwalk? Try our Beach Mats! Now that we’ve addressed the subject of the types and installation of beach fencing, in this newsletter we’ll tell you about another NETCO product–our fabulous Beach Mats. 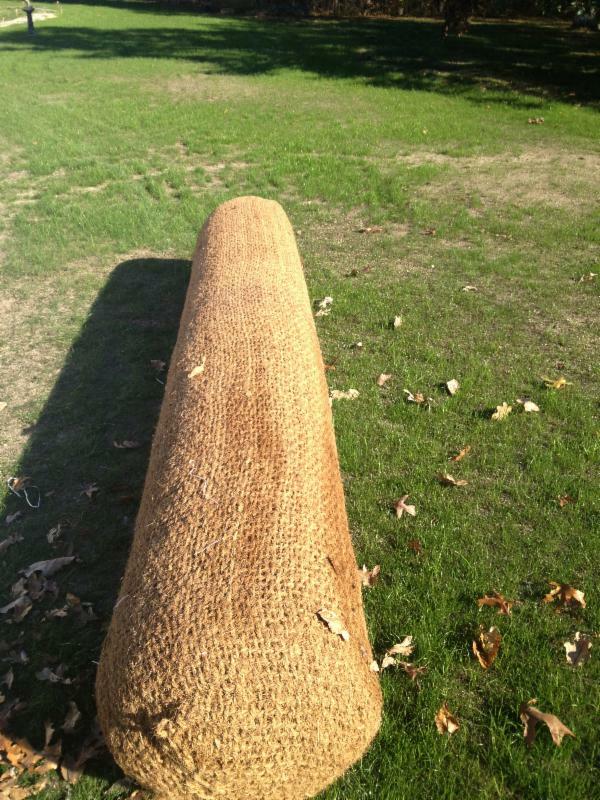 Be sure to give us a call if you would like more information about our Beach Mats or other NETCO products or services at 781-863-6270. We hope you enjoy our newsletter. As always, we ‘d love to hear from you! 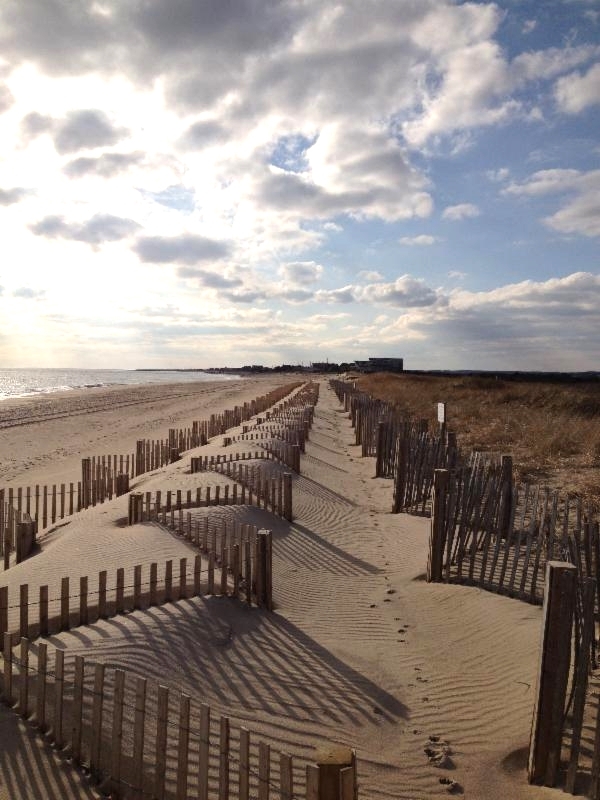 This edition of the NETCO Beach Newsletter focuses on the types and uses of sand drift fencing. 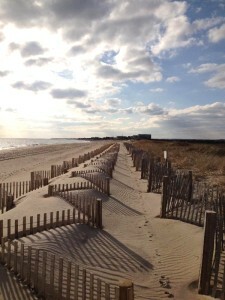 Be sure to take a look at Beach Notes for interesting news items. We hope you find our newsletter enjoyable and informative and, as always, we appreciate your feedback. 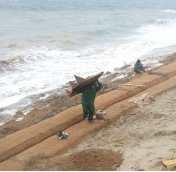 This edition of the NETCO Coastal Erosion Newsletter is about the use of green oak lumber for coastal applications. 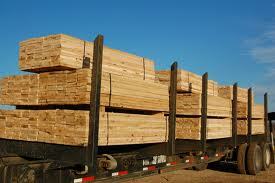 Green oak is a coastal building material that offers several advantages over use of pressure treated or standard lumber. 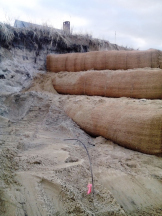 We are also pleased to announce that the NETCO’s coir envelope project at Blue,The Inn on the Beach (Plum Island, Newbury, MA) was selected to be the cover article for the International Erosion Control Association March, 2014 magazine. More information coming soon. 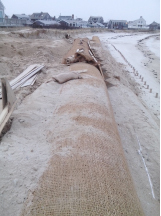 This edition of the NETCO Beach newsletter focuses on the use of coir logs and the recent new development NETCO has made to improve upon the traditional coir log wrap. We are also adding a new section called Beach Notes, short descriptions of articles and news about beach, shoreline and coastal bank erosion developments. As always we welcome your comments. 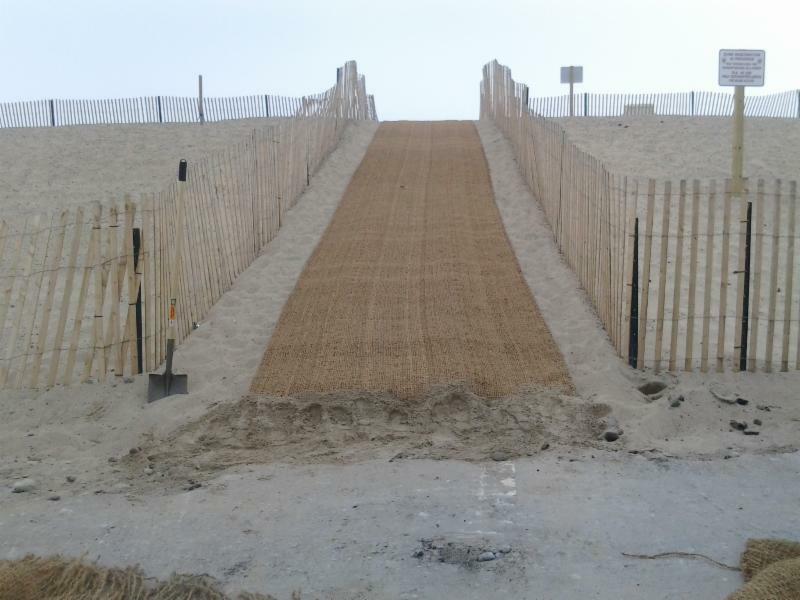 We are pleased to introduce our new, NETCO Newsletter with a focus on coastal beach, bank, and dune erosion control. The purpose of our newsletter is to report interesting scientific and engineering articles relating to coastal erosion, legal and regulatory developments, as well as to report on NETCO projects and products. At NETCO we offer “soft” solutions to hard erosion control problems. Please click here to read more about our Specialty Construction services and products. This winter so far has produced several damaging nor’easter storms in Massachusetts: Juno (Jan. 26-28), Linus (Feb. 2-3) and Marcus (Feb. 8-9). In addition to large amounts of snow, the coast of Massachusetts has had significant wave and storm surf impacts. The town of Sandwich, in particular, has seen more than its fair share of damage to their coastline. Of these storms Juno produced some of the highest winds seen on the Cape in the last several years with gusts from 60-70 mph, in addition to snowfall exceeding 2 feet. 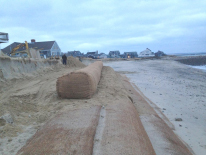 NETCO’s erosion control project in the Town Neck Beach area of Sandwich covers 420 lineal feet of beach front. The design has five terrace levels with two rows of coir envelopes for the bottom and two terrace levels and one coir envelope for terrace levels three, four and five. The system was anchored with green oak toe anchor posts. The bottom two terrace levels were designed and constructed below the beach face (beach face at time of construction was at +11.5 ft.). The bottom terrace level was four feet below the existing beach face (+6.5 feet) to protect against scour and undercutting. The top terrace level was set at 21.5 feet The 100 year storm elevation was calculated to be at +20.9 feet Therefore, the project design covered a vertical elevation of 15 feet from the bottom of the first terrace level to the top of the fifth terrace level. 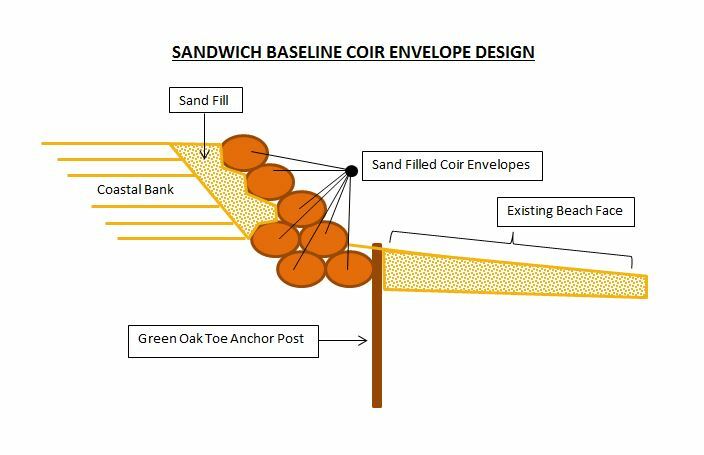 Placing the toe of the envelopes below the beach face to +6.5 feet and anchoring the bottom two terrace levels with green oak posts, worked well. The bottom three terrace levels held up well and did not move, no toe anchor posts were broken, and none of the envelopes were torn or lost their sand fill. What did happen though was that the storm waves and storm surge from Juno went both over the top of the installation, and perhaps more importantly, eroded the ends of the installation. First, the storm waves and surge at the first high tide during the height of Juno went over the top envelope and rearranged the entire top row. The envelopes were pushed back and to the sides at various angles to the beach. Therefore, after the first high tide of the storm the top row was rearranged so that, in some locations, the protection was decreased from +21.5 feet to +18.5 feet in several places. The weight of the single top envelope was not sufficient to resist the force of the storm waves and surge. 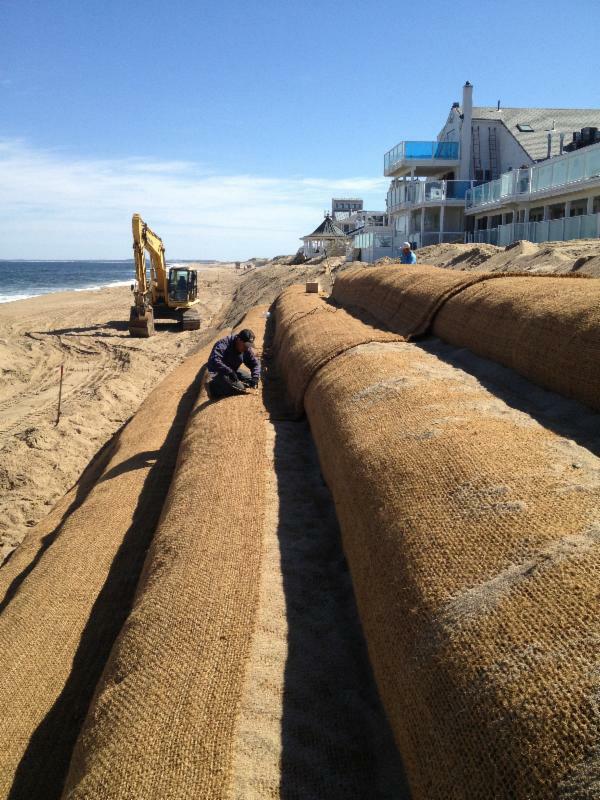 In order to deal with this issue for future installations in the Town Neck Beach area, an obvious zone of very high energy waves, we would recommend using two or more rows of coir envelopes for all terrace levels, and installing anchor posts on the landward side of the top terrace level to hold the envelopes in place. A second issue was the significant impact of the storm on the ends of the installation. The designed returned the ends of the installation back into the coastal bank (see photo). The returns were toed into the coastal bank at all five terrace levels. However, the high energy impacts of the storm eroded the coastal bank on either end by additional +12 feet, leaving an unprotected area behind the returns. This was not due to the installed coastal protection, but due to the entire coastline being eroded. As the waves went over the top of the front facing coir envelopes, and the storm progressed through several high tides, the water from the waves drained to either end and eroded the sand fill behind the envelopes as well as the natural coastal bank. Some of that sand ended up on neighboring properties and some went out to sea with the back rush of the waves. This situation would have happened no matter what type of coastal bank protection was used—rock gabions, geo tubes, concrete sea wall or steel sheet piling, etc. The force of the storm eroded the ends behind the installed protection leaving a clear drainage path for waves and surf going over the top to drain to ends and take the sand behind the installation with it. End effects are not easy to solve. The most obvious solution is to excavate a trench back into the coastal bank so that the ends can be placed in such a way that the waves cannot go behind the ends. However, as each storm erodes neighboring properties the end returns will need to be extended. On some properties this may not be possible due to legal property lines, placement of the homes relative to property lines, and permitting issues, etc. Other more complex and long term solutions involve beach nourishment, relocation of homes, placing the homes on piles, or area wide solutions involving town and neighboring properties. 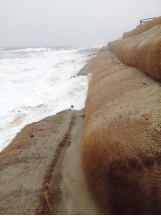 But at the end of the day, erosion around the ends of any coastal protection system can be challenging to mitigate.